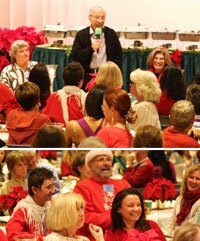 The Holiday Season is an exquisite time to gather together and celebrate the abundant blessings of the year. At USM, one of our very favorite holiday traditions is to invite our vibrant volunteer community to enjoy a festive Volunteer Appreciation Luncheon. We delight in the tremendous opportunity to give thanks to the many people who contribute so generously with their time, talents, and loving service. 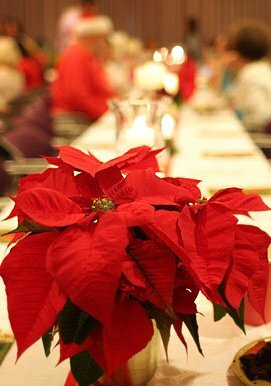 As the volunteers entered the downstairs USM Classroom, they stepped into a beautifully decorated and joyous space, glowing with candlelight and scores of radiant poinsettias. Jubilant music filled the air and everyone enjoyed a delicious turkey dinner, complete with delectable desserts including flourless chocolate cake and pumpkin pie. The honorees visited and connected with each other over coffee and tea, and Drs. Ron and Mary Hulnick shared their deep appreciation with the group for their dedication to USM and for being in service throughout the year. The Volunteers are a vital part of the USM Community, and it is truly from that support that USM is able to operate at such a high level of consciousness. Ron continued in saying that the Grads who stay in the energy are giving a huge gift to USM, the students, and most of all, to themselves. It is through participation in a Community such as this that one can deepen in the learnings. Cheers and exclamations of surprise were heard throughout the room when the volunteers opened their gift. Dr. Mary Hulnick shared with the group about the gift, which was a downloadable compilation of nine beautiful Meditations from Ron and her, entitled Blessings of Love. Light-hearted laughter and applause erupted from the group! Mary-Kate Proietta, USM’s Volunteer Resources Director, expressed her gratitude to all of the volunteers for their loving service and deep commitment, adding that she is honored to be surrounded by such a caring community. Linda Whitaker, First Year Reading Program Director, shared her appreciation to the Readers for their sacred service, joy, and impeccability. Second Year Reading Program Director Julie Klingel also lovingly acknowledged the Readers and expressed the many blessings she has received by working with such dedicated, loving souls. To all of our Volunteers who support the University and share in this journey, we give our heartfelt thanks. We honor and acknowledge you. Blessings of Joy, Grace, and Loving to you and your families!